Darrell has a degree in Costume Design with a minor in vocal performance from the University of Wisconsin-Whitewater. His work in professional theater has taken him on 20 national tours to 49 states and 6 countries on two continents as Wardrobe Supervisor for the tours of ANNIE, Cats, West Side Story, Rent, The Sound of Music, and Chita Rivera: The Dancer’s Life. He was the Star Dresser for the First National Tour of Jersey Boys (completing 648 performances). Darrell toured as a hair and make-up assistant on the second First National Tour of The Producers for two-and-a-half years. Darrell has been lucky enough to work with Chita Rivera and Ann-Margaret. Darrell has designed costumes for the University of Wyoming, UNC at Greely, and St Norbert College (De Pere, WI). He designed the costumes for Jim Olm’s The Magdalene, which ran Off Broadway. 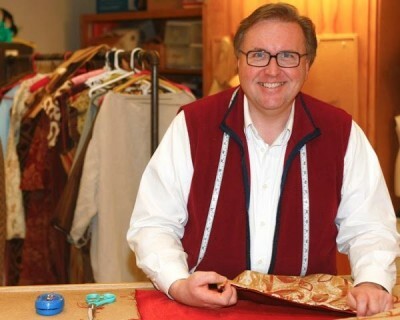 Darrell was commissioned to design the costumes at Casper College for the world premiere of Arthur Giron’s St. Francis in Egypt. His work as a costume designer includes Music Man, West Side Story, Godspell, and A Funny Thing Happened on the Way to the Forum. In his “off time,” he climbed Mt Fuji and learned to scuba dive off the coast of Hong Kong. He is blessed with a very patient and understanding family and several special friends that have allowed him to “run away and join the circus” as each opportunity presents itself. He is currently pursuing an MFA in Costume Design from the University of Idaho.